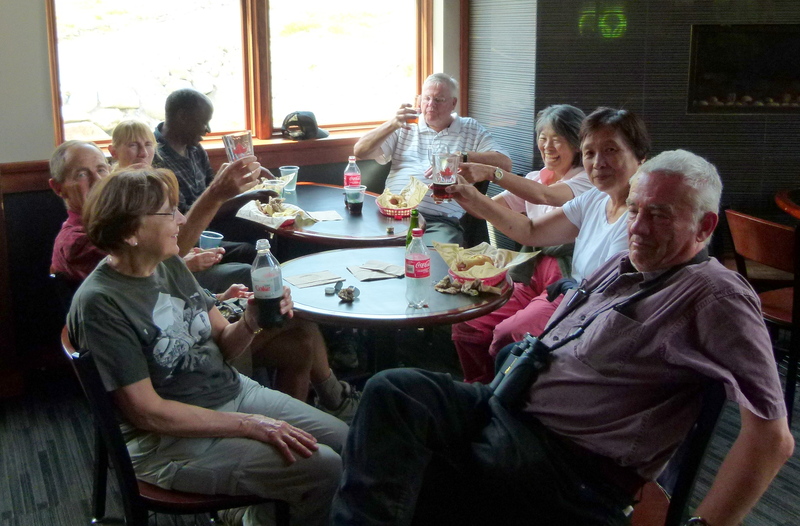 Marian, Gerhard, Glen, Kay, John, Sheila and myself (Roger) departed Petra’s at 7:30 sharp heading for Cypress Bowl. Deciding to avoid the downtown rush hour traffic, I took the shortcut via the Second Narrows bridge (picking Mike up on the way) and arrived only 20 minutes and 18 seconds after Gerhard and Glen in their separate vehicles (Gerhard actually timed the wait). At the Cypress Bowl parking lot we met Jonathan and Lorraine, Marion, and Kirsten for a total of twelve (we argued later in the pub about the total as some of us were sure the number was thirteen but we couldn’t figure out who we left on the mountain). With a perfect summer morning to begin with, we headed east along a relatively flat trail to Yew Lake. Along the way we heard a Steller’s Jay, and saw a few Common Ravens, Dark-eyed Juncos, a Gray Jay, and a Turkey Vulture. Also, throughout the day, several Varied Thrushes were heard calling but were not seen. The birds being relatively scarce we spent more time on the alpine vegetation with key plants being Copperbush, White Rhododendron, and the deadly poisonous Indian Hellebore. **Note: Click on photos for an enlarged view! In Yew Lake itself we saw, mainly, Yellow Pond-lily and Buckbean. Walking north away from the lake a number of small birds made their appearance and we had good looks at Townsend’s and Yellow Warblers, Red-breasted Nuthatches, and Band-tailed Pigeons. 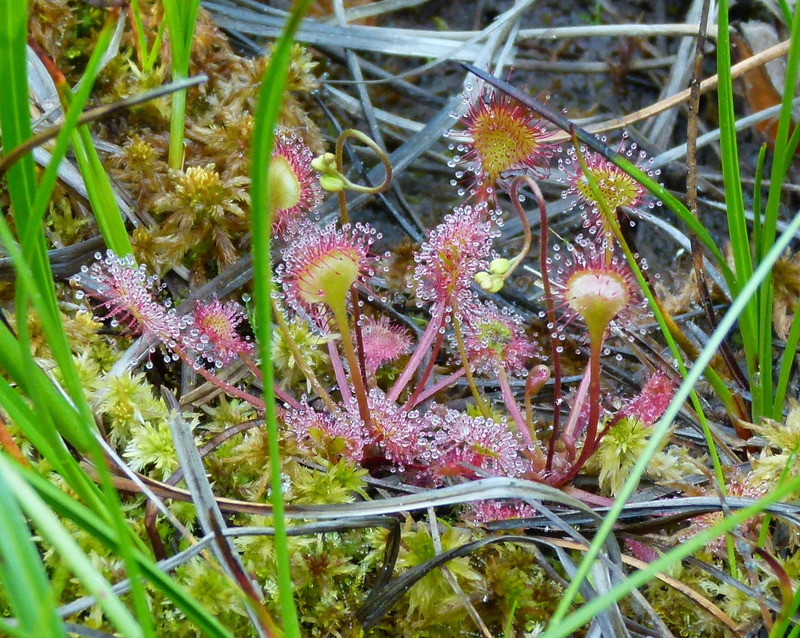 In the marshy areas Rein Orchids, Cotton Grass, and beautiful patches of the insect-eating Round-leaved Sundew plants were found. Part of the Yew Lake circular walk had a side trail, also a circuit, through an old-growth forest which included some giant Amabilis Firs and led to a side branch off to a lookout down to Howe Sound and Bowen Island. This side trail being only about one kilometer in distance, we decided to give it a try but part of it was quite steep and made for difficult walking, especially for those with knee problems (included most of us). 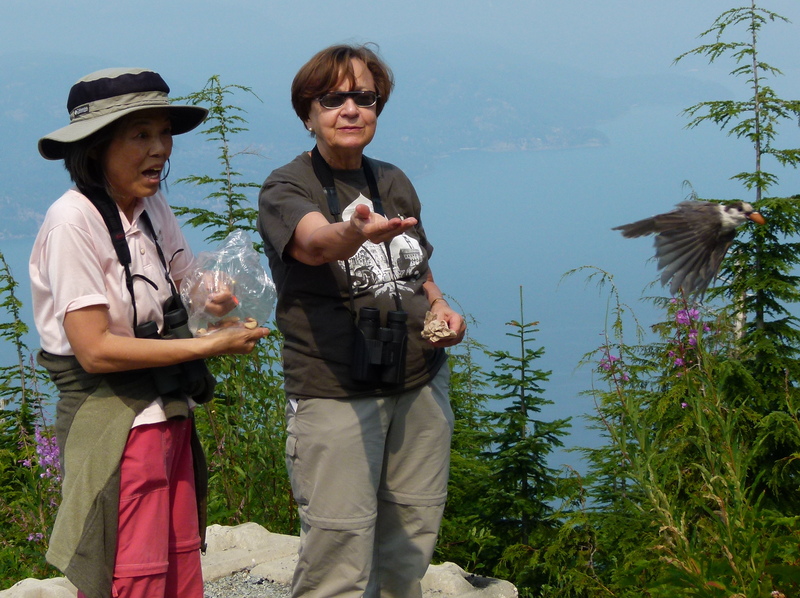 However, those who made it to the lookout were rewarded with a great view of the islands in Howe Sound and some additional birds. Flying about us, as we had seen in our previous visit last year, were a number of Vaux’s Swifts. 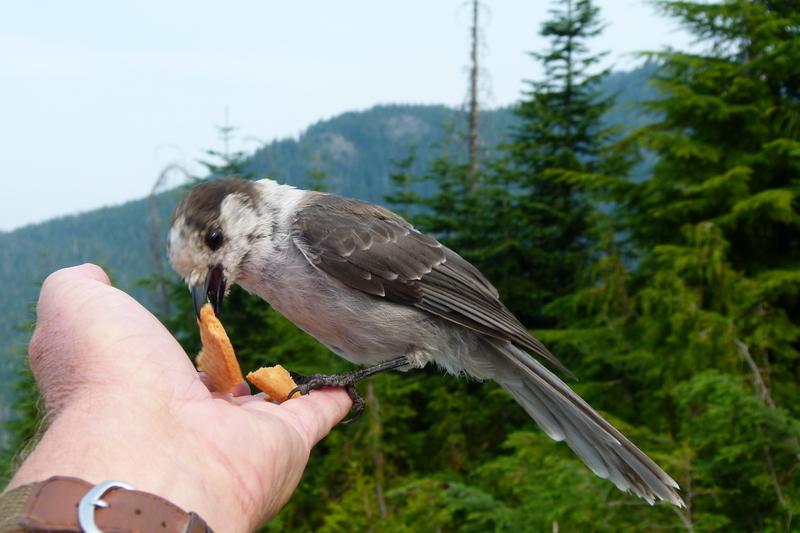 A pair of Gray Jays (Whiskey Jacks) arrived and were quite happy to share our lunches. The return trip back to the parking lot was relatively uneventful except for our meeting Wayne Weber, the birding guru, who was, strangely enough, photographing plants! 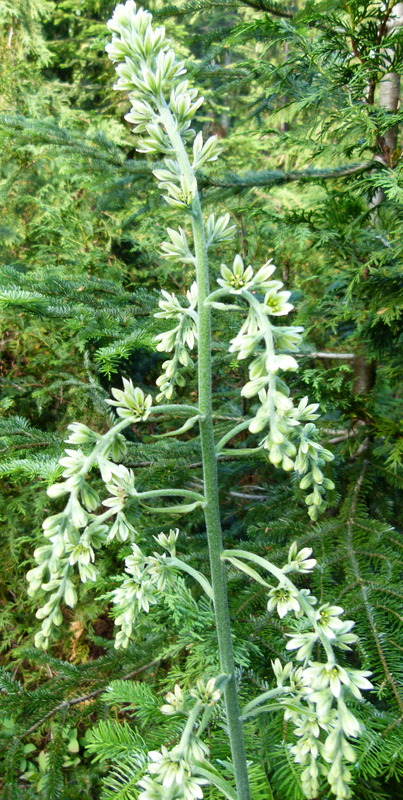 He was able to help in identifying a few of the plants we were having difficulty with… Cotton Grass for one. Thanks Wayne! Back at the cars the group decided, unanimously, to stop at the pub in the lodge for refreshment. I’m not sure if alcohol was a factor in Kay and Sheila’s decision to start a DNCB Casual Birding splinter group to do snowshoe birding in the approaching winter months but it seems to have some serious backing from some of the others. I assured them that Tom would be eager to participate. Tom was unable to participate on this trip due to a more important commitment to play golf! Ha! 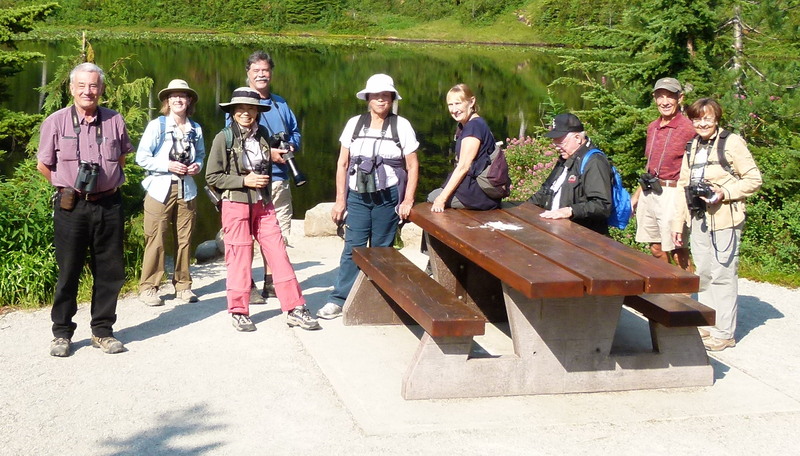 A photo of the entire group is not available due to us being separated at the Bowen Lookout trail but we did have some isolated ones at various parts along the way. Stay tuned for information regarding next week’s exciting adventure. Lorna we missed you, and Tom of course. 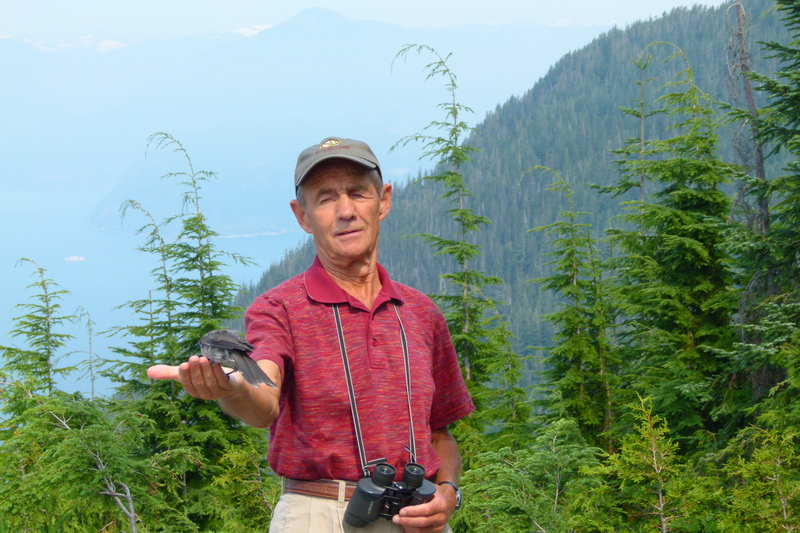 This entry was posted in *DNCB, Band-tailed Pigeon, Cypress Mountain, Gray Jay, Townsend's Warbler, Turkey Vulture, Vaux's Swift, Yellow Warbler, Yew Lake. Bookmark the permalink.